Seems like everywhere I look, enforcing transparency is the theme and is being touted as the possible solution to today’s problems. Massive financial crisis? See Daniel Roth’s Wired article for a plan for radical transparency in the financial markets. See Toby Segaran and Jesper Andersen of freerisk.org talk about transparent asset rating schemes and database schema. Or read Umair Haque’s call for Finance 2.0. Political corruption? See Transparency International or use Global Integrity‘s corruption assessments. Or see what tools the Sunlight Foundation is working on. Our detachment from food production systems? Read Michael Pollan’s Omnivore’s Dilemma in which he proposes slaughterhouses transparent to the world instead of the immensely secretive systems in place now. I love it. It seems like ages since David Brin wrote his book, “The Transparent Society: Will Technology Force Us to Choose Between Privacy and Freedom?”, which I consider to be one of the most under-rated books out there but which deserves to be cited as often as, say, Hernando de Soto’s “The Mystery of Capital: Why Capitalism Triumphs in the West and Fails Everywhere Else”. 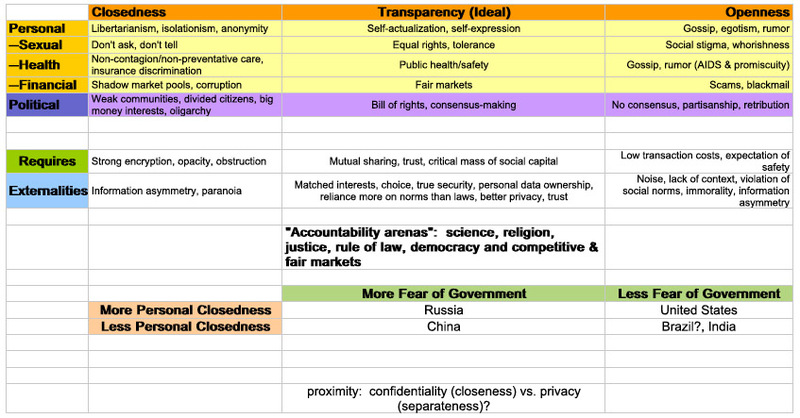 Brin proposes a world of total transparency, where we give up much of our “privacy” (to exclude within our homes) in public, in exchange for the ability to watch the watchmen, police, government, other organizations, and each other. Sunlight, it is often quoted, is the best disinfectant. I agree. The hand-wringing over Facebook’s privacy controls is necessary, but in the sense that we need to have control over our own data and reputations, but not necessary in that we are moving towards a world of publicly visible reputations. Secrecy — that is, darkness, and being able to hide what you do to different people — allows for corruption, duplicity, and deceit. It breaks down trust. It leads to massive Ponzi schemes if combined with favorable regulatory environments (one of the genius outcomes of a radical free-market ideology to allow organizations to bilk people out of all their money). It leads to realpolitik and cutthroat realism. It discourages education (the less you know, the more I can exploit you) and human rights (you may know, but you can’t do anything about it). I get really excited about this stuff. This is the way we have to go in so many areas — towards transparency and accountability — if we hope to achieve sustainable progress. And this goes for us, in our own lives, in our own countries, before we even hope to press other “evil” or “secretive” or “authoritarian” countries to open up to the rest of the world and be more democratic. So if you have any more examples of transparency projects in other sectors (like in education or in voting machines, et al), or projects I could get involved with in that area, please let me know. As you know, I’m hoping to build a massive, transparent reputation system where people will be able to affect other peoples’ reputations, which they must defend and can respond to, creating feedback mechanisms…all out in the open. People I’ve bounced this idea off of for Galapag.us usually respond with disgust that they don’t want to have their privacy violated. But consider the alternatives. When you can use a reputation to build capital and prove yourself, and not just be afraid of people knowing things about you, wouldn’t those benefits outweigh the drawbacks? What about all those people you know who get over, and get away with screwing other people over? What about them? How do we hold ourselves accountable? How can I convince you that Galapag.us will be huge? 1. Make an open reputation system for, say, Congressmen or world leaders. It may be unlikely that either take to it quickly, but perhaps in time. And given our location, perhaps you could get a couple Congressional members to jump on board – they all want to seem tech-savvy. 2. Or, don’t limit the audience by type, just by selectivity. Much like Gmail created artificial scarcity with invites and other companies do (like musicforbusypeople.com or that one DC night life site). This would get first-movers motivated by prestige (and perhaps that is part of reputation). For the first one, I think Sunlight might be interested and they would be great people to hook up with. Kevin, that sounds like a good approach. The platform needs a killer app first. Might require a little experimentation to see what people respond to the most… Selectivity would be important for scaling up, I think. I guess my thinking, though, is that the first users will be the first-movers…i.e. techies.